Dr Bike is back for 2017 and starts on Tuesday 28 February. Dr Bike is a free fix-it clinic for basic bike issues available to both staff and students, funded by the Sustainability Office. This service provides basic maintenance and repairs such as punctures repair, tuning brakes and oiling chains. 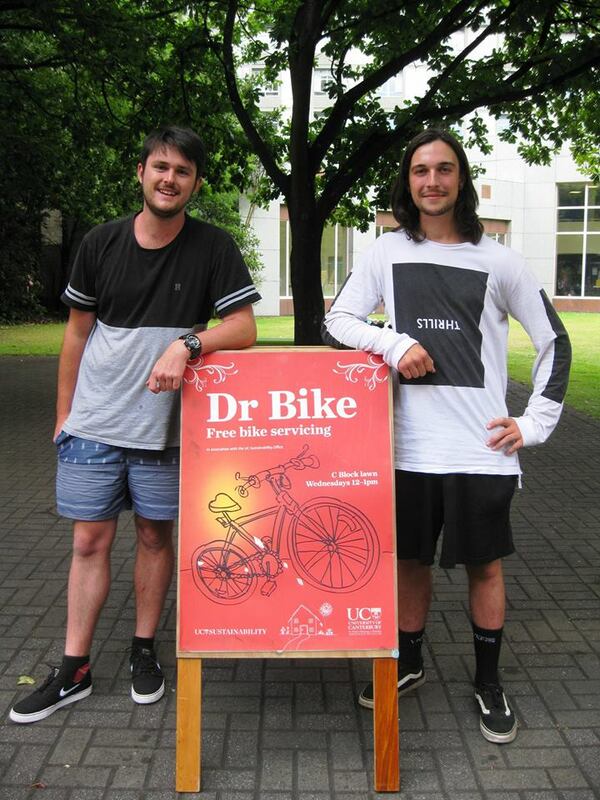 Olly Ng and Zac Porter are running Dr Bike on Tuesdays, 12-1 pm on C Block lawn during term time. For more information, check here. We are excited that Dr Bike will be using eco-friendly bicycle lubricants, thanks to a two-year sponsorship from Christchurch-based company Biomaxa. A number of bike thefts have recently occurred across campus and from the accommodation halls since the semester began. Campus Services have increased security patrols around bike parks and have apprehended some thieves. Unfortunately, we expect thefts to continue, so cyclists should be pro-active by ensuring the security of their bikes. Bolt cutters are being used to cut through cable locks. D locks, particularly kryptonite are recommended and are more effective in deterring thieves. Please report any suspicious behaviour immediately to Security on 0800 823 637. Stolen cycles should be reported both to Security on 0800 823 637 and to Police on 03 363 7400. Christchurch City Council resumes work along the Uni-Cycle route on the north side of Ilam fields today. The work is expected to take around six weeks. Construction of the Uni-Cycle route along Ilam Road is also expected to start this week. Most of the work will be carried out at night to minimise the impact on traffic. Please take care when travelling through these areas. Follow all on-site signage and look out for construction crews and others. 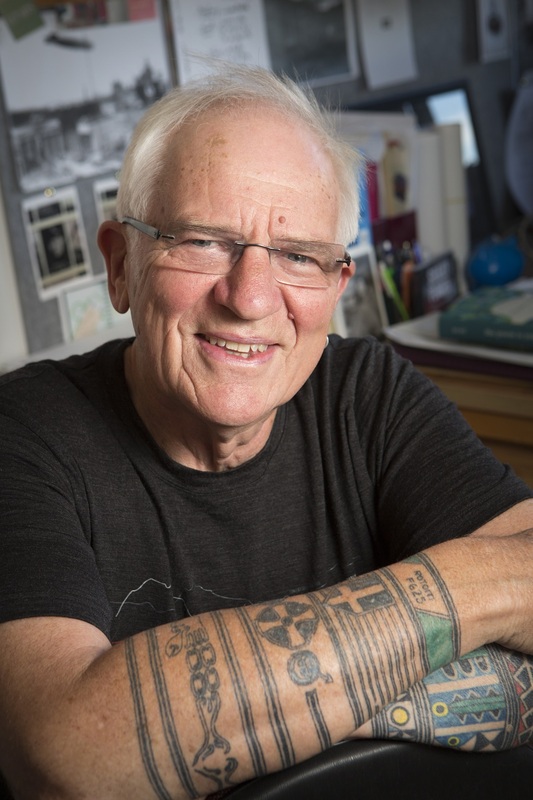 An annual series of lectures celebrating Professor Ross Ihaka’s contribution to the development of R and its leading role in statistical computing is offered by the University of Auckland’s Department of Statistics. The series is named after Ross Ihaka, Associate Professor in the Department of Statistics at the University of Auckland. Ross, along with Robert Gentleman, co-created R – a statistical programming language now used by the majority of the world’s practicing statisticians. It is difficult to over-emphasise the importance of Associate Professor Ihaka’s contribution to our field. We named this lecture series in his honour, as a way to recognise his work and his contributions to our field in perpetuity. Come along to the Canterbury University Press (CUP) book launch of Blood Ties: New and selected poems 1963-2016, the latest collection by UC’s popular poet Jeffrey Paparoa Holman. This gripping and powerful collection spans Jeffrey’s writing career of more than 50 years. Exploring the journey of a life in Aotearoa New Zealand, Blood Ties touches on universal human concerns: love, loss, grief and courage in the face of difficulties, in a language that is accessible to all. Blood Ties has been designed and printed in collaboration with Ilam Press and will be launched by acclaimed author and UC Emeritus Professor Patrick Evans. Please email your answer to: universitypress@canterbury.ac.nz by 12 noon Tuesday 7 March. The winner will be drawn at random and announced in Intercom on 10 March.